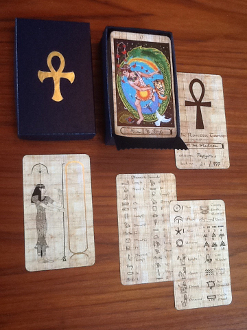 Rosetta Tarot in full size is back, reincarnated with the Papyrus edition. This numbered edition of only 777 copies has retained the original art but updated the borders with the look of authentic papyrus, with the card titles hand written in Egyptian hieroglyphs. Comes with a hieroglyphic key card for translation, and a customizable significator card for your name, plus a card signed and numbered by the artist. Pdf instructions on reading and writing the hieroglyphs included; download link will be emailed. Little white book pdf upon request. I encourage you to customize the significator card yourself with the included instructions, not only is it fun and easy but you will learn a lot about the hieroglyphs in the process! But if you insist, it is an optional service that can be added.